They’re a tough act to follow, the women’s soccer team from Seattle Pacific University. 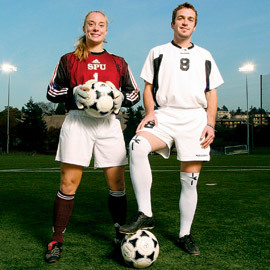 Jennifer Hull was one of the nation’s top goalkeepers again in 2004, while Brent Egbert led the SPU men in scoring. On a blustery October night in Bellingham, fifth-year senior Brent Egbert waited for the cue to take the field. In the preceding women’s game, SPU had just beaten host Western Washington with one of their best displays of the season thus far. The men’s teams would play next. Egbert and his SPU teammates, also nationally ranked, thought they would trot quietly out to begin warm-ups. “And then we leave the locker room and outside, forming a sort of tunnel, are the women,” recalls Egbert. “They’re cheering for us and clapping. Seattle Pacific has long been recognized as a national force in soccer, and that’s still true — in spades. At the end of the regular season, both the women’s and men’s programs contended for NCAA tournament berths. Egbert & Co. just missed a playoff spot, while the unbeaten women were chosen as the top seed in the Far West and went on to host the West Regional Championships. They won their first quarterfinal game, only to lose the regional crown to Seattle University 2-0. In some ways, the men’s and women’s teams fed off one another this year. The women rose rapidly from a fledgling program four years ago into a powerhouse, thanks to the historical success of Cliff McCrath’s teams the past 25 years. And now the men are the most improved team in the region, inspired, perhaps, by dedication and teamwork exhibited by their female counterparts. Jennifer Hull is among six seniors who were members of the original team that began play in 2001. As sophomores, they won a conference championship. As juniors they did it again, and made the playoffs. Hull was voted to the All-America team. The Falcon men want the same thing. Egbert, who led Seattle Pacific in scoring this year, echoes Hull’s sentiments. “It has to do with the history of SPU soccer,” he says. “You start each season with the goal of winning an NCAA championship,” something that has been realized five times in the past.